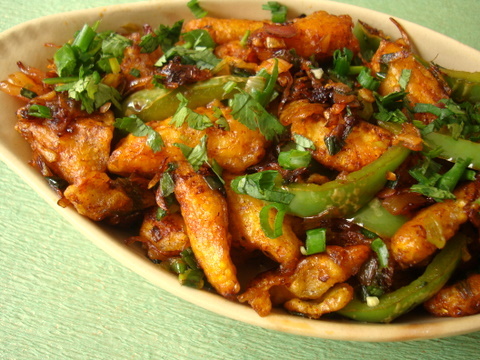 In a bowl, combine maida, cornflour, rice flour, salt, ginger-garlic-green chilli paste and water to make a thick paste. Dip the washed and drained baby corns into the batter such that its well coated. Place each piece that is well coated with the batter into the hot oil. Reduce flame and deep fry till the baby corn is almost cooked. 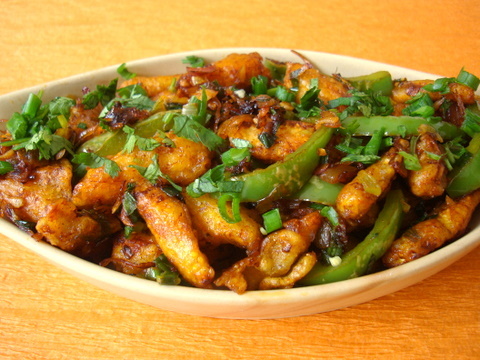 Increase the flame towards the end of the cooking process and fry the baby corn till it turns golden brown. Remove onto absorbent paper and keep aside.Heat oil in a large wok and once the oil is piping hot, add the chopped garlic and stir fry for a few seconds. Add the green chillis and ginger and stir fry on high for a few seconds.Add the whites of spring onions and stir fry on high for 3-4 mts, constantly tossing them. Add the sliced capsicum and stir fry for another 3 mts. They should retain their crunch. Reduce to medium heat and add the brown sugar, soya sauce, tomato ketchup, chilli sauce and vinegar. Combine well and cook for 2 mts. Add 3 tbsps of water and cook for 2 mts.Add the deep fried baby corn and combine. Toss on high flame for 1-2 mts. Turn off heat.